Navajo rugs are rising in popularity because of the trend in Southwestern decors. The originals were made on the reservations with traditional Navajo designs. A good book on American Indian arts and crafts should teach you all you need to know about recognizing these rugs for their collector's value. There are many deceptive imitations on the market, so be careful. The weaving of Navajo Rugs is a dieing art. Fewer and fewer young people are learning to weave from their mothers and grandmothers. It is a shame that this traditional art may fall by the wayside. There are a few traders who are working to keep Navajo Rugs a tradition that survives the future. Older Navajo's are helping young ladies with their weaving, in the hopes that they will keep this art form vital and alive, as well as being able to make a living for their families through their art. The cheaply made Mexican rugs have replaced the traditional Navajo Rugs in many markets. The quality of the Mexican rugs, their texture, and the vibrancy of the colors are inferior. Don't waste your money. Save and buy yourself a true piece of art. The Navajo Rugs are more expensive, but you will have made an investment. A truly good piece will only increase in value, while it's Mexican counterpart will only be good for resale at a yard sale. Each area of the Reservation has it's own style of rug. The Klagatoh Red is from Klagatoh Arizona, the storm pattern is from Tuba City, Arizona. 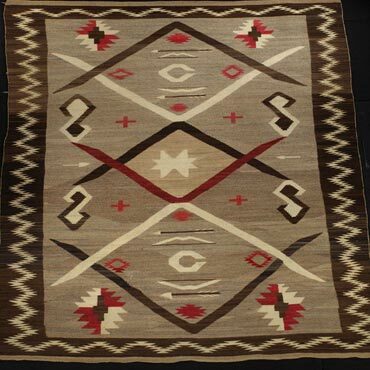 Around the turn of the century, many of the local traders encouraged their local weavers to weave rugs of similar colors and patterns to make a standard for their particular area of the Reservation. The most well known of the Traders was John Lorenzo Hubble, who popularized the Navajo Rug in the beginning of this century. He coached the area weavers into making patterns that he could sell to the "Beliganas" (whites) all over the country. The Two Grey Hills Rug above, is made from all natural colors. Meaning their were no commercial or vegital dyes used. The variations in the colors is made by expertly spinning different shades of wool into yarn. The black comes from sheep that produce black wool, the white from sheep that produce white wool, and the different shades of grey come from a combination of both. This style of rug is very time consuming for the weaver. She must first raise her sheep, shear them, clean and card the wool, then spin the wool into yarn of the desired shade. Only then can she start the time consuming task of weaving her rug. Some of the women who weave still use an awl to spin their yarn. They spin the awl on their leg, while twisting the yarn to the desired thickness with their other hand. It is fascinating to watch, and the true masters of this art make it look simple. It is not simple, getting each strand of yarn the same size, the same shade, is very tricky, and is why many women buy commercial yarns. The hand spun wool varies in thickness more than the commercial wools, but the hand spun rugs are more valuable.